Tournament Director and Chief Development Officer Eddie Gonzalez awarded the check to YMCA of Metro Atlanta Chief Development Officer Lauren Koontz in a recent ceremony. 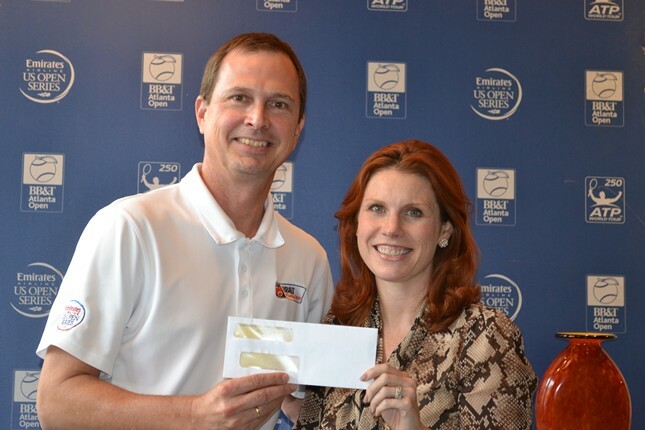 The BB&T Atlanta Open presented a check to the YMCA of Metro Atlanta, the tournament’s charitable partner, bringing the total raised to more than $175,000. The funds were raised as part of the second annual Tennis Night on the Town event. Set at the Twelve Hotel in Atlantic Station, Tennis Night on the Town drew supporters, sponsors and special guests for an exciting evening last July 19. The Y is impacting the lives of children and families in our community every day. Being open to and serving all is inherent to the Y’s mission, and programs are made available to everyone, regardless of their ability to pay. The BB&T Atlanta Open and the Y have partnered to increase youth participation in tennis in low income communities and offer opportunities for young people to engage in activities during the tournament that promote lifelong healthy living. This partnership is made possible thanks to BB&T’s North Atlanta Regional President, and YMCA of Metro Atlanta board member, Brant Standridge. “Being able to have a positive impact on underserved youth, particularly through tennis, is a great thing for the Y and BB&T. Providing access to a lifelong sport that builds confidence and inspires healthy living helps the children and our communities reach their full potential,” said Standridge. As part of the Y’s partnership with the BB&T Atlanta Open, tennis pros delivered a tennis clinic for youth to learn fundamental tennis skills on site during the BB&T Atlanta Open. YMCA teen leaders also had the opportunity to watch a live match, experience the thrill of professional tennis and meet John Isner, who won his second Atlanta title last July. The BB&T Atlanta Open and YMCA are excited to continue this partnership and create even more opportunities for Atlanta youth in the coming years.